Bear with me Fredia, I’ll get to the good stuff ….Let me start by saying that I am a reluctant football fan. Being a retired band director’s wife I have seen more football than I ever planned to. And viewed it from ground level, where I usually hung out with my husband as he worked. I have been broiled by the Texas sun at football stadiums, rained on, hailed on and had the beginnings of freezer burn while sitting in the countless stands waiting for the precious eight minutes of the half-time performance. I have been hit in the head with a football pass, once, as I walked across the end zone with my husband during pre-game warm ups. This might explain a lot and it hurt. I have learned that a camera will not protect you if a thundering herd of pumped up guys in padding decides to come out-of-bounds where you are standing. So when my husband retired, after 27 years of Friday night games, I was done with football. Done, you hear me, except of course for Sunday games, Monday night games, Thursday games and the occasional Saturday games on television. We are Dallas Cowboy fans, with all the triumph and pain that fact implies. I tell you all this to relate a school football story. My elementary school, Travis Elementary, has a remarkable Physical Education department. Fredia Sneed is one of our three P.E. teachers and is beautiful, inside and out. She is one of those teachers you can look up to; for her dedication, her discipline and her compassion. It is often said about coaches that they teach young people about life. In Fredia’s case it is the truth and her 4th, 5th and 6th grade students are expected to work hard and behave themselves. She has taught at Mineral Wells ISD for thirty years. That alone should impress you with her tenacity and passion for what she does. So Fredia had arranged for an assembly in her gym on Friday. She had invited a former Mineral Wells alumni, Alvin Garrett, to speak to our 6th graders. I had to ask who Alvin Garrett was. For those of you who are shaking their heads in disbelief, see paragraph one and please understand that I did not grow up in Mineral Wells as Fredia did. Our school district has a tradition of inducting outstanding alumni athletes into a Hall of Fame. Mr. Garrett was there to present a gold football to the Hall of Fame as part of the NFL’s 50th year celebration. 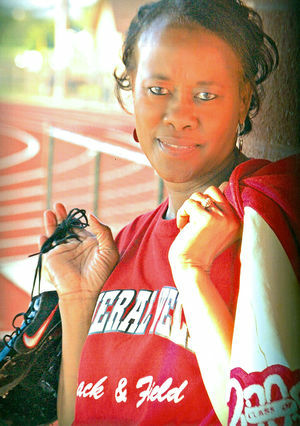 Fredia was also being inducted into the Hall of Fame for her stellar accomplishments as a track and field athlete in the 1980s. In a short forty-five minutes Mr. Garret made a lasting impression on a gym full of sixth graders. He showed us a highlight reel and the kids cheered as he scored touchdowns and made play after spectacular play. But it dawned on me that his mere celebrity was not the message here. Thank goodness. We have enough celebrities without substance in the world . It was not that he was a famous former NFL wide receiver that had won a Super Bowl. He was. It was not that he was charismatic and larger-than-life and captivated you with his laugh and his charm. He did. It is not that he presented a gold football to his alma mater in commemoration the NFL’s 50th year. He did that too. We also won that night’s football game against our rival Graham for the first time in 27 years. Did he inspire our team to do its best and capitalize on good coaching and hard work. Yes, I think he did. But for me it was Alvin Garrett’s heartfelt message that was the real gold prize. For all those sixth graders sitting on the gym floor watching and listening and believing. He saved his best touchdown performance for them. He told them the truth. That he felt he was the least likely to succeed out of all his family, but he did, through hard work. His message was the best mixture of common sense and hope for students in a town that has had a hard knock reputation in the past. ” You must get your education and go to college” ” What are you going to do to make your family proud?” “You have what it takes to succeed.” “Give your best at anything you do and let God handle the rest.” Those kids watched as Mr. Garrett laughed and complimented their P.E. teacher. They watched as he had his photo taken, with Mrs. Sneed, their P.E. teacher. He shook hands with half the kids as they left the gym, and I swear most of their feet were not touching the ground. It was magic. Thank you Mr. Garrett. And thank you Fredia. You are a Hall of Famer.